This is the second in a series of graphic novel adaptations of classic martial arts books from Shambhala Publishing. The first is the Book of Five Rings-2012 (review to follow in a few weeks) and the third is a forthcoming version of the story of the 47 Ronin due out November 5th 2013. The Demon’s Sermon on the Martial Arts takes the translation by the renowned translator William Scott Wilson and adapts it to the graphic novel/manga format. This book may be of particular interest to Aikido practitioners due to O Sensei’s well known interest in the tengu (translated in English as demon). It is even possible O Sensei read the book as a part of his martial arts studies. The Demon’s Sermon on the Martial Arts was written by Issai Chozanshi (this was a pen name-real name Niwa Jurozaemon Tadaaki, 1659-1741, a samurai of the Seki-yado fief, now located in Chiba and Ibaraki prefectures). For more information about him and his times, see the Kodansha translation of the Demon’s Sermon on the Martial Arts pages 195-196. The graphic novel is based on an English translation by William Scott Wilson, published by Kodansha in 2006. Mr. Wilson has translated many books from Japanese that are of interest to martial arts students. These include: The Book of Five Rings (2002-which is also available in graphic novel form from Shambhala), Hagakure (Kodansha 1979); The Life Giving Sword by Yagyu Munenori (Kodansha 2003) and The Unfettered Mind by Takuan Soho (Kodansha 1986). The translation was adapted by Sean Michael Wilson, who currently lives in Japan. He is a Scottish author of over a dozen books including the graphic novel versions of The Book of Five Rings and Hagakure (published by Kodansha 2011). He has a blog site at seanmichaelwilson.weebly.com. The illustrator is Michiru Morikawa. She is an award winning illustrator and manga artist. There are numerous internet sites with information about her work including one from the BBC and Facebook. The word translated as demon is tengu in Japanese. Unlike the western conception of a demon as being in league with evil forces, the tengu is a spirit who inhabits the mountains and in addition to having a trickster side, possesses spiritual knowledge. This knowledge was regarded as valuable by martial arts practitioners who sought the deepest teachings of the martial arts, beyond technique. According to the belief of the day, the tengu would impart this knowledge only to people they felt were worthy. It is in this context that the stories and philosophies of the tengu are passed on to those diligent and brave enough to seek them out. This is the most famous story in the book and has been a part of many other books including D. T. Suzuki’s Zen and Japanese Culture, Bollingen Series LXIV Princeton University Press 1959, pages 428-435. After reading the afterword you can go back and reread the text with deeper insight. The graphic novel faithfully follows the spirit of the William Scott Wilson translation. The primary difference is the graphic novel does not include the chapters: The Seagull and the Mayfly Discuss the Tao; Profit and Loss for the Bulbul and the Wren; The Skills of the Heron and the Crow; The Dream of the Cucumber and The Ghost at the Old Temple. What the graphic novel format provides not in the printed translation is the emotion conveyed by the illustrations. One I found particularly engaging was a scene with the samurai bowing to the cat and asking for instruction in The Mysterious Technique of the Cat, (page 21). You must first remove all your selfish and distracting ideas from your mind and so purify yourself from within. This is called ‘inner purity.’ (The Toad’s Way of the Gods page 7). 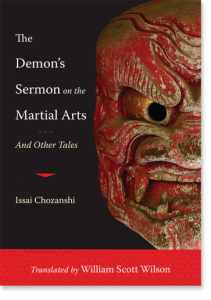 The teaching of the Demon’s Sermon is of great value for both martial arts students and everyone else. Readers who like the manga format will relate very well to this modern pictorial expression of this classic book and its philosophy.